Tonight, Law & Order: SVU season 20 episode 18 tackled an extremely challenging case — and also tackled a long-simmering issue in Dodds’ memo. What we’ve known about this is quite simple: It’s something that Fin used knowledge of to leverage his way back to Olivia’s precinct. It’s also something that could have particularly-damaging information on Benson. It’s been the dark cloud hovering over Peter Gallagher’s character, a question in desperate need of an answer. As for what was in that memo … maybe we’ll never quite know. 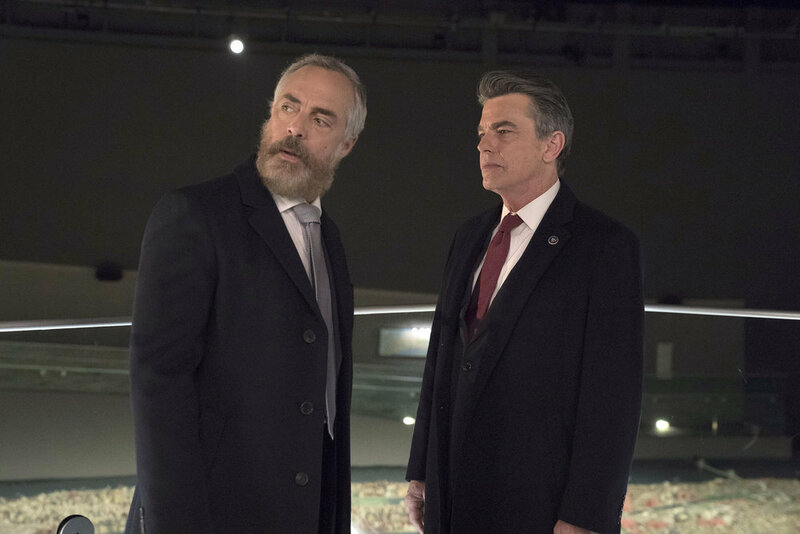 Yet, in tonight’s “Blackout” the memo came out amidst a conversation between Dodds and Rob Miller (Titus Welliver), the wicked high-powered attorney who was the suspect at the heart of the case. Because Miller served as Dodds’ attorney, he has knowledge of the memo and plenty of other skeletons in his closet. In our mind, the memo was written out of sadness and out of rage for Dodds, a man who has lost a lot in his life and may very well harbor deep regrets. It’s the reason why he openly offered Olivia a copy after the case — to bury this hatchet, insist that her career is safe, and try to push forward. We didn’t get necessarily a buffet of great Olivia/Fin scenes in the episode tonight, but kudos to the writers for bringing Fin in to discuss with her his knowledge of the memo … while also promising that he would never let someone try to jeopardize her career. Olivia’s time running the SVU goes on, as it should given that she, Rollins, and the rest of the team had one of the hardest cases of the season trying to arrest Miller for his assault on defense attorney Nikki Staines (Callie Thorne), a woman routinely at odds with the NYPD and even trying to sue her. This is a man who oozes despicable confidence, thinking that his knowledge of the law is a get-out-of-jail free card and that nobody can touch him. He also thinks he can get everywhere with his charm — hence, why he tried to take Olivia out for drinks hoping he could schmooze his way out of suspicion. Benson’s too smart for that and even if she did, Rollins was working already behind the scenes, following leads and making connections. When Miller was found out (on the “date” of sorts with Liv), he immediately backtracked into “it was consensual,” looking for another way to weasel by. He worked every angle, crossed every T, and even seemed to threaten Nikki out of testifying. Miller’s one of the worst — he was out to not only assault, but humiliate Nikki and then threaten her to keep her from ever going on the stand. Welliver may have been the man in black on Lost, but this suits this character perhaps even more. It took using Dodds to get any intel out of him — a version of Dodds who waved attorney-client privilege before even entering his undercover chat. That’s when the memo came up, Miller was cuffed, and then Olivia found out about a mystery she’s been largely unaware of for quite some time. A longstanding rule of SVU is that justice is not just exclusive for the few. Investigating police (and attorneys for police) is far from desirable. You risk breaking down a blue wall, division, and of investigations into yourself. The trust issues and aftereffects can be palpable and problematic. Some cops would cower; Olivia Benson never does. “Blackout” proved her resiliency, but also the unit’s in taking smart, measured approaches to solving complicated problems. Bringing in a guy like Rob Miller is no easy feat, but there’s no doubt that the city of New York can breathe a little easier because of it. There was no real mystery that he was the man responsible, so our appreciation for the episode came more from the procedure, from piecing together the clues and seeing the police community bond together … even if it meant helping someone well-known for public battles with them. Want more news regarding the future of SVU? Be sure to visit this link to see when the series is back on NBC, and also what lies ahead.